Viruses are attacking your body! Quick, set up some towers and blow them up! Wait—what? Evolution Defense is a tower defense game where you set up immune system towers to destroy virus monsters as quickly as possible. The enemies will run around a set track over and over again and all you have to do is try to improve how fast you can kill them all. Man, I wish microbiology was like this. 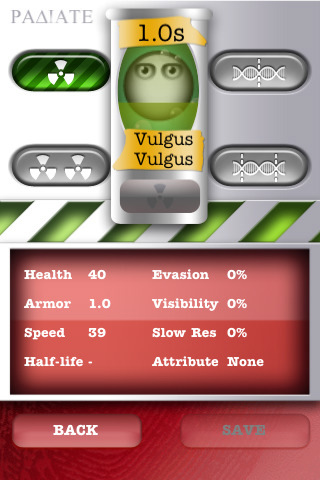 Evolution Defense is a free app from Adduce AB for the iPhone, iPod touch, and the iPad. Let me start off with this: The theme is great. A tower-defense game against small creepy microscopic parasites? Awesome! The graphics are kinda creepy since you are essentially looking into an extremely simplified blood vessel system, but they all have their own charm. The different viruses have different textures and faces, the towers all have a unique stylization with a wormy look to them. This game features a truly deep tower leveling system. First, you have 6 unit types. The first three are boost towers that increase attack, range, and speed. You have 3 different main towers first separated by ranges of their attacks. From there, each tower has 7 options of upgrades. Power, Range, Speed, then a slowing ability, poison ability, Chain attack, or spread attack. If a tower has more range, it has slower but stronger attacks and the towers with less range have faster weaker attacks. There are key differences between Evolution Defense versus any other tower defense game. Firstly, the enemies never leave the field. They go in a cycle around a set path. The body gets sicker (as represented by a green health bar next to the “Start Wave” button)the longer the viruses stay in the body. Secondly, the interface consists of buttons. No labels, text, or grids, just touch an empty area, select an image, and upgrade it using the same button interface. To know what the buttons are, you have to hold your finger over it and a description pops up. This requires some practice and it’s just something you have to get used to in order to progress. 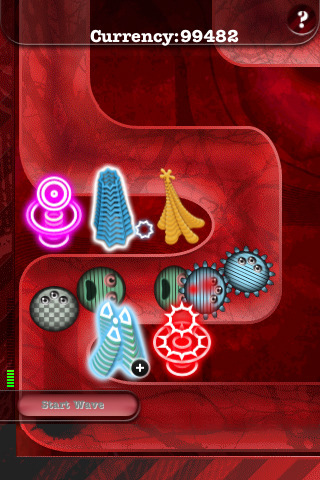 Some viruses have different powers like speed increases or healing for their fellow microbial brothers and that will change up the intensity of gameplay. You basically play survival mode as you try to last as many waves of enemies as possible before your body kicks out. The best I did was Wave 42 on Hard, which was an extremely long play session. Unlike most Tower Defense games, there is no fast-forward function to move the level along. You have to sit and watch enemies move around for a long time, and you do not gain money during gameplay so if you are low on funds, you won’t be upgrading and have to wait for the enemies to do a full cycle with your current set up. The game would greatly improve with more level layouts and a fast-forward button. I couldn’t get the chance to play the Multiplayer mode since that requires Bluetooth connections with someone else with an iDevice. Too bad, as the virus creation system seems interesting and fun. And that’s this game in a nutshell. Evolution Defense is an interesting addition to the tower defense genre, but it just needs more polish and some more features to speed up the gameplay. For a free app however, this is a nicely done project with potential for greatness. AppSafari review of Evolution Defense was written by Joseph Ho on September 17th, 2010 and categorized under App Store, Free, Games, Tower Defense. Page viewed 4404 times, 1 so far today. Need help on using these apps? Please read the Help Page.